I have voted 3 co-bloggers and one of them won- Congrats Earth! This is the 2nd week of the promo. If you want to win just like me, visit UniqLo’s Facebook Fanpage to know more. 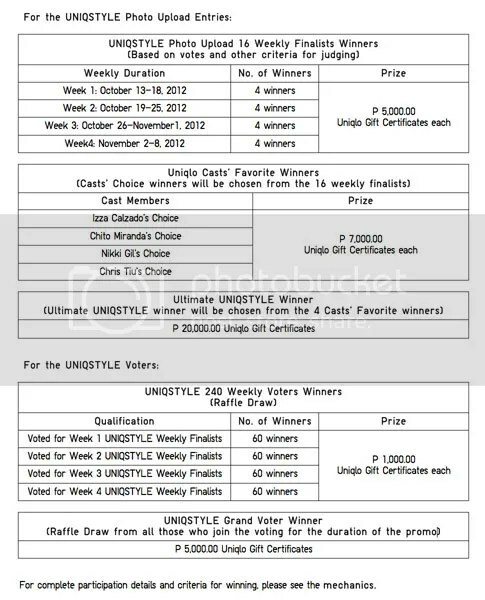 You have two options to join: as a voter, and/or as one of the Fashionista by uploading your picture while wearing Uniqlo’s merchandise. If you want to join as one of the Fashionistas, then you still have 2 weeks to go! Visit any Uniqlo’s store now and take a photo. They have mentioned in their email that you can claim the prize on November 16-18, 2012. Kindly check your email again.